It seems that after many years another Italian biker, Vincenzo Nibali, is about to win the “Tour de France“, very likely the most important cycling race in the world. I’m very happy for the national prestige, however, as far as I am concerned, sport recently has lost that fascination it used to have. Medicines, doping, scientific studies have despoiled the athletes of that romantic, magic aura, that gave them the traits of demigods born to test and break human limits. Nowadays when you see a record crashed, you cannot help but wonder: did he deserve it or did he have a “little” help? Gino Bartali ‘s only doping was good food and a bottle of Chianti. “Ginettaccio“, as he was called, was born in Ponte Elma, near Florence, in 1914 and very soon developed a great passion for cycling . 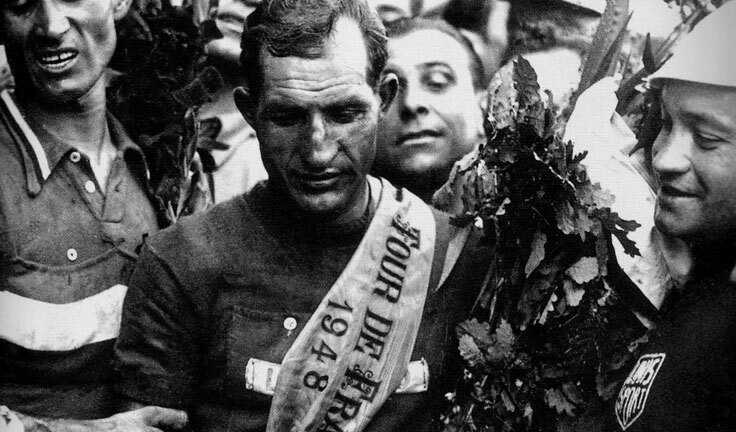 In the thirties, he become professional and the whole nation learnt to love him for his passion, incredible determination and spirit of sacrifice, that made him win the ” Giro d’Italia” twice and the “Tour de France” in the years before the outbreak of the second World War. In those tragic years, when all the competitions were suspended, he used his bike to save people’s lives. 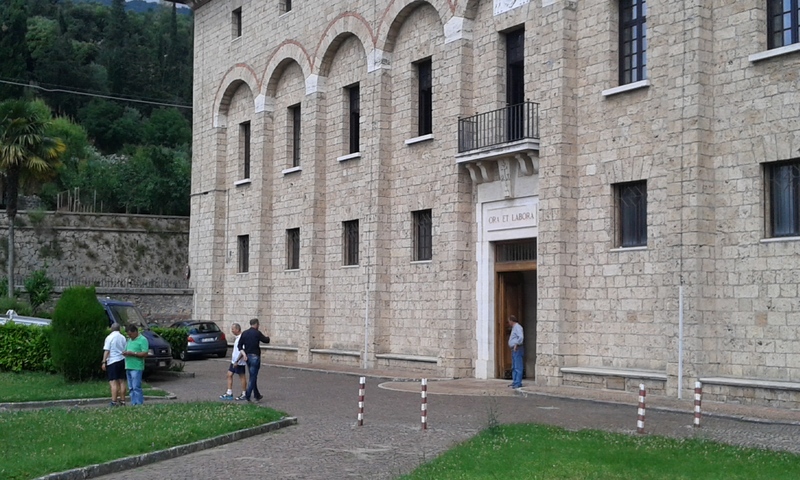 Every day he cycled from Terentola-Cortona railway station to Assisi (67Km) in the midst of shootings and bombings, hiding in the crossbar of his bike the documents to help the Jew refugees leave the country. When the war was over, he was considered too old for the races and the new rising star of cycling was his antagonist and friend Fausto Coppi, five years his junior. After the war Italy was a disintegrated country, always at the verge of the civil war. 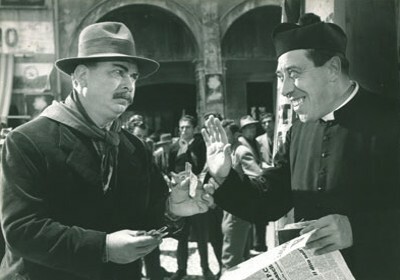 Guareschi called it the country of Don Camillo & Peppone, that is, a nation divided between the Christian Democrat Party of Alcide de Gasperi and Andreotti and the Communist Party of Palmiro Togliatti e Pietro Nenni. 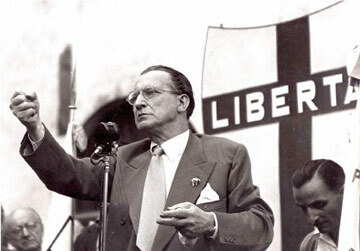 The Christian Democrats largely won the first republican election of our history in March 1948, therefore Alcide De Gasperi became head of the government. However, strong concerns continued to spread throughout the country, exploding dramatically at 11.30 on July 14, when Antonio Pallante, a young Sicilian linked to extreme right-wing, attempted to the life of Togliatti in Piazza Montecitorio, wounding him seriously. Tumults and riots exploded, radio broadcasts were interrupted, a general strike was proclaimed and the Minister Mario Scelba ordered bloody repressions against unauthorized demonstrations. Those were days of high tension, but where was Bartali? Bartali was in France for the “Tour”. He was 34 and the leader of the Italian team. He knew that, somehow, he was a second choice as the two bright stars of cycling Coppi and Magni had remained in Italy for both political and personal reasons.Furthermore the Italian team was not actually welcomed, as the French could not forget the “great betrayal”, that is, when Italy had announced to enter the war on the side of Germany eight years before, right when the Nazis were marching to Paris. During the stages the Italian athletes were constantly insulted and Bartali himself was attacked by a spectator. After 12 stages, he had 21 minutes delay from the leader, the French Bobet. What follows is the narration of how an athletic deed may become gloriously heroic. Bartali was concerned about his family and had desperately tried to contact them. Right before the beginning of the 13th stage he received a call. He left his bike and seized the receiver, hoping to hear his wife’s voice, but it wasn’t his wife, it was Alcide De Gasperi, the President himself. He politely inquired about the race and asked Bartali if there were any chances he might win the “Tour”. 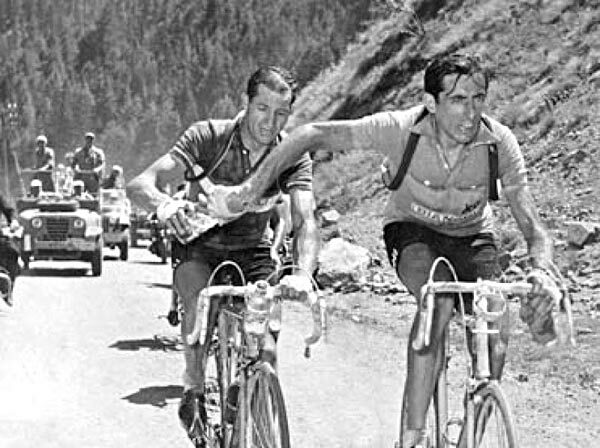 Bartali declared it almost impossible as there were too many minutes that separated him from the leader. Therefore, the President asked him to do his best to win at least a stage, in the hope that the sport news might distract people from politics. Bartali was stupefied but many years after that event, he confessed that those words had given him the adrenaline he needed to do what it will make him a legend. Bartali won stage 13 with a large margin, jumping to the second place and in the next stage, Bartali won again, and took over “the yellow jersey” as leader of the general classification. Bobet was now in second place, eight minutes behind. The next stage, stage 15, was also won by Bartali. Stage after stage, the Italian excitement about the Tour de France increased, and the political tensions quieted. 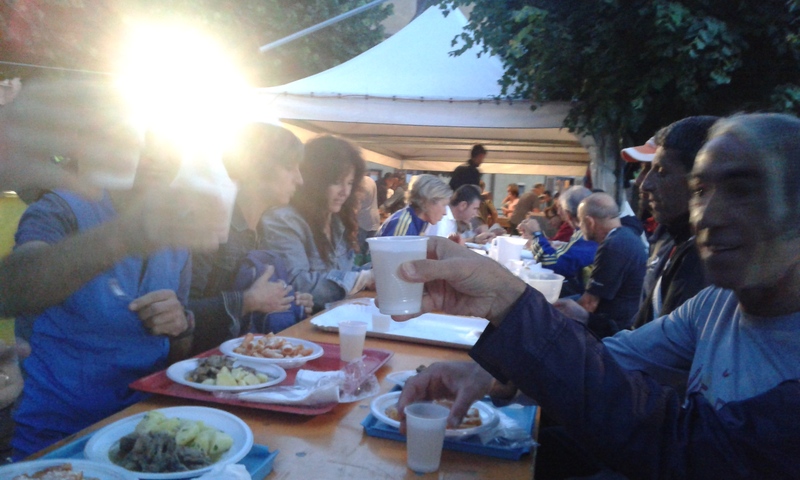 When the 25th of July “Ginettaccio” was on the Parisian podium, the situation in Italy was totally under control. An invisible hand had pushed the saddle of the Tuscan athlete, who had succeeded in driving his bike to a legendary world where a man “too old to win a tour” may become a hero. What did the good Pharrel Williams say ?”Clap along if you know what happiness is to you“, well I guess he has done a lot clapping this year considering the immense success of his worldwide hit ” Happy“, however, do you know what happiness is to you, or better when? Metaphorically speaking when is the most intense moment of bliss: when you cross the finish line or the moment just before, when you are overwhelmed by that powerful combination of excitement and pain, in short, when you are “just about”? “ Just about” would have been Keats‘s prompt answer. 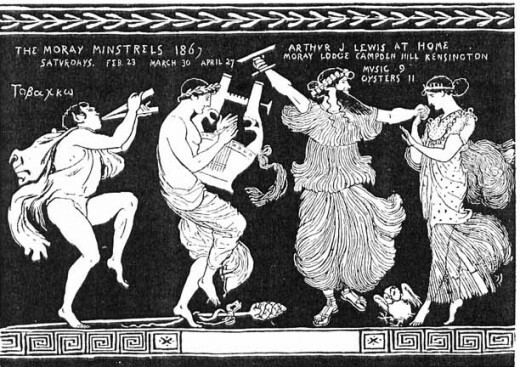 In his “Ode on a Grecian Urn”, the poet is charmed by ” the leaf fringed legend ” that “haunts” the shape of an urn and focuses on the images which are depicted on its frieze . He is attracted by one scene in particular: there is a “bold lover” who is “winning near his goal “, that is, a beautiful young girl. He is just about to reach her, but unfortunately he is destined to live that frustrating condition forever, as art has stopped that moment and made it eternal. That moment does not mean grief for the poet, but quite the contrary, for him it is the highest moment of happiness man can experience . The young boy’s love will be “for ever warm” as it is “still to be enjoyed“, and he will be ” for ever panting” for a girl whose youth and beauty will never fade away. Unfortunately time cannot be stopped, as once you eventually achieve your goal, your feelings are so overwhelming to devour that moment of bliss to leave you with “a heart high sorrowful and cloy’d, a burning forehead, and a parching tongue” looking at the ashes of what now is past. Canova ‘s “just about” can be admired in his magnificent statue of ” Cupid and Psyche“. “Cupid and Psyche” is a tale written by Apuleius a Latin-language prose writer. It narrates about the adventures of a young girl Psyche, who is uncommonly beautiful. Cupid, the son of Venus, desperately falls in love with Psyche and carries her to an enchanted, magnificent palace where they can secretly consume their passion, but he prohibits her to know his identity. The happiness of the young couple is threatened both by the envy of Psyche’s sisters, and by the hostility of Venus, who wouldn’t want her son to marry a mortal, whose beauty could be compared to her own, a goddess. Psyche follows the perfidious suggestions of her sisters thus disobeying Cupid, who consequently abandons her. She desperately seeks her lover, but she falls into the hands of her mother-in-law, Venus, who forces her to undergo insurmountable trials, which eventually she passes thanks to a series of extraordinary helps. A happy end follows: Jove himself will celebrate the wedding between Cupid and Psyche and will turn her into a goddess, making her immortal. 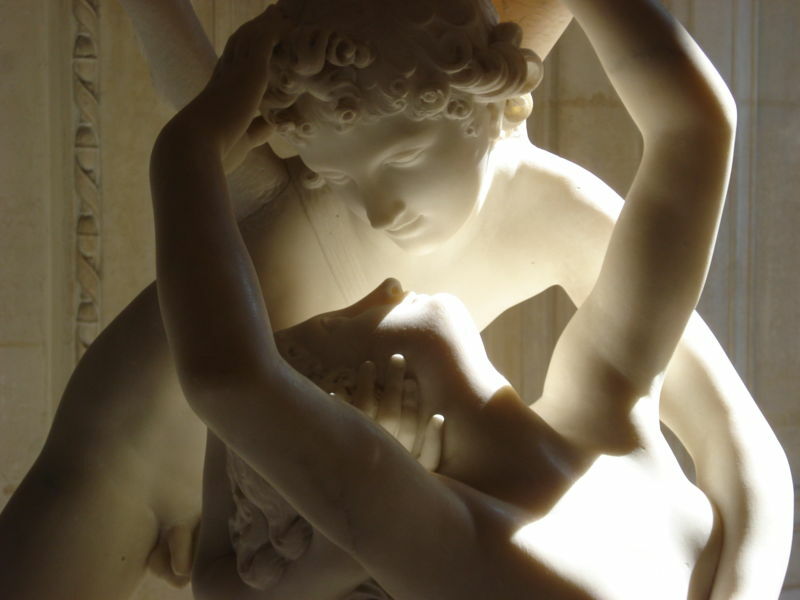 Canova represented in his statue the instant of the story, when he imagined intensity was at its pitch, that is when Cupid is “just about” to kiss Psyche. There is a slight, refined eroticism, while Cupid tenderly contemplates the face of the girl he loves, while Psyche reciprocates him with equal warmth and sweetness. You can feel that tension, before it bursts into passion. Psyche’s arms form a circle around the faces of the two lovers, which seems to frame the focal point of the statue. It’s inside that circle that the emotional tension swells and Cupid’s endless craving is close to be satisfied.He is just about. 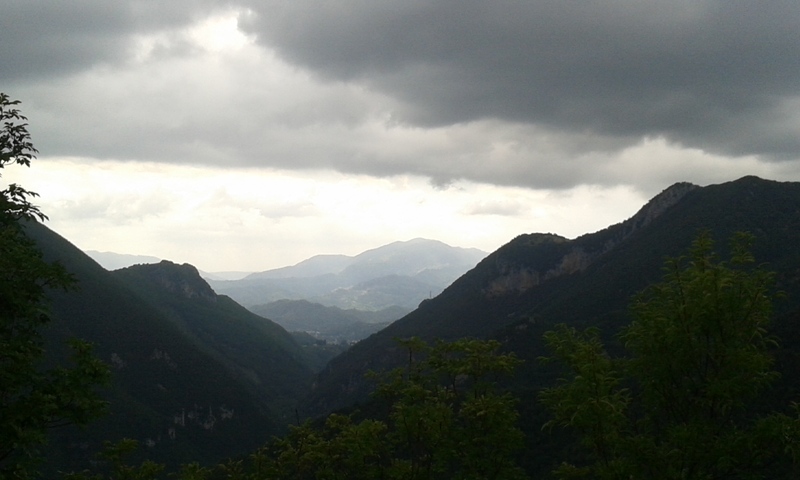 Hello, has anybody seen the summer? Where are the heat, the sunshine, the blue skies and that longed laziness on sandy beaches? We are all here, ready in our flip-flops, towels and bikinis but, actually, this July looks like more a rainy April. It’s really unfair for those who are on vacation and for one person in particular: ME. That’s why this week-end we have decided to go somewhere else and drive to Simbruini mountains, about 100 km far from Rome, to reach Subiaco. Why? To run, of course. 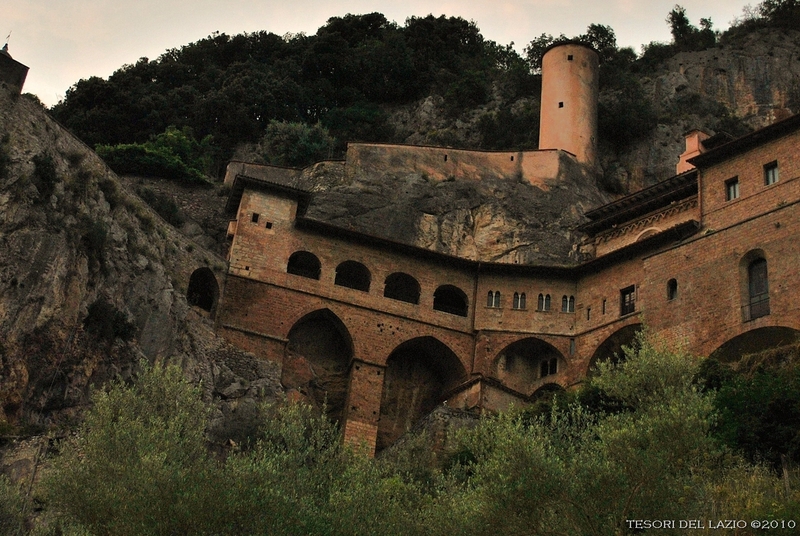 Subiaco is particularly renowned as a tourist and religious resort for its sacred grotto (Sacro Speco), in the medieval St. Benedict’s Abbey, and for the Abbey of St. Scholastica. 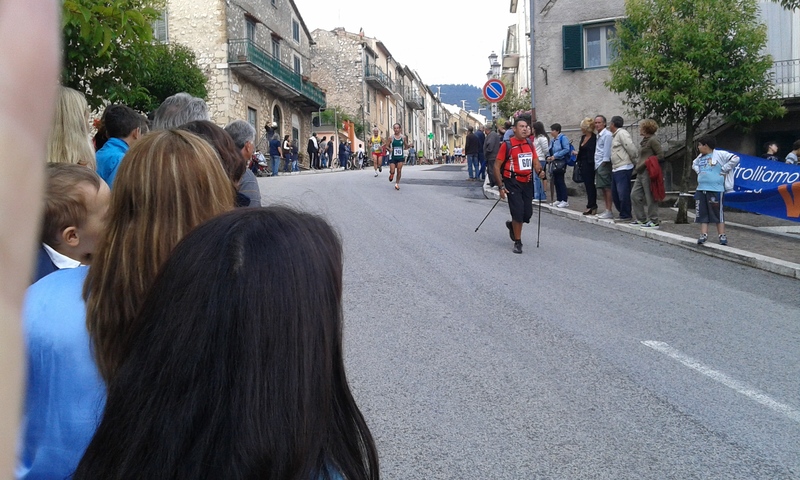 In July there is a very picturesque race called “la Jennesina” . The route is enchanting as the race starts at the monastery of St.Benedict, then you run through the sacred places where the Saint lived and dictated the “Rule of Saint Benedict“, which contains the precepts for his monks ( the most famous is “Ora et Labora“, that is “Pray and Work” as you may see it chiseled at the entrance of the monastery), to reach the fascinating medieval hamlet of Jenne. 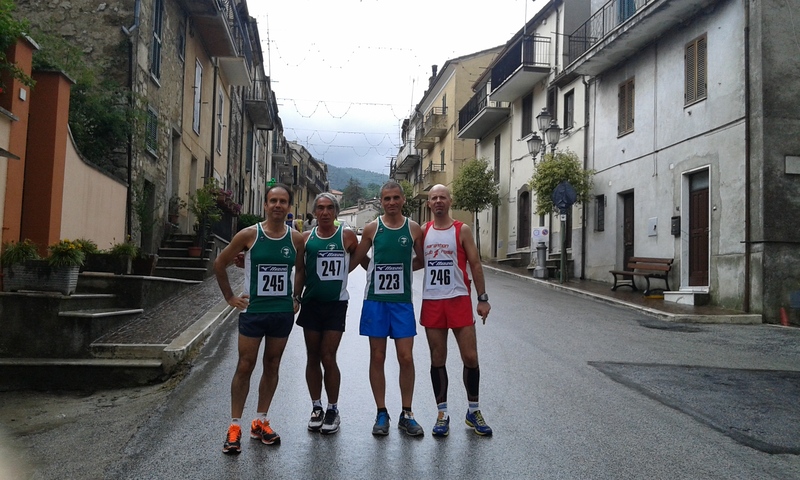 10 kilometers of history, natural beauties and all uphill!!! 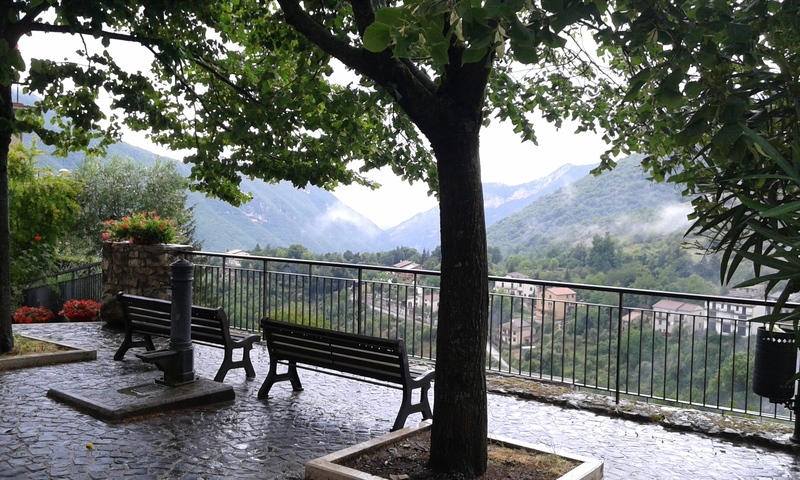 When Mr Run and I reached Subiaco, we soon realized that we had left spring behind to be welcomed by a gloomy, rainy, autumn day. 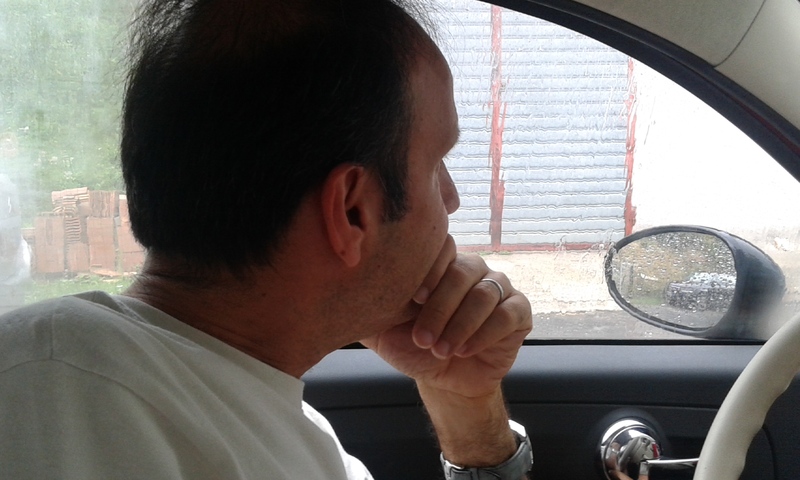 We had to stay in our car for more than half an hour, because of a heavy, endless shower. What does that motto say?”Better the devil you know than the devil you don’t know“, in fact, I started to wonder, that maybe we’d better stay at home, as I was picturing myself waiting for him under the rain at the finish line, or in the car for a couple of hours. I didn’t even have my iPad or a book with me! Magically the rain ended and the air was clear and fresh. Mr Run soon put on his running shoes and with some friends of his team rushed to get to bus to reach the start at the monastery, while I would wait for him in Jenne. Well, I had all the time to visit the place. Jenne is actually really quaint. 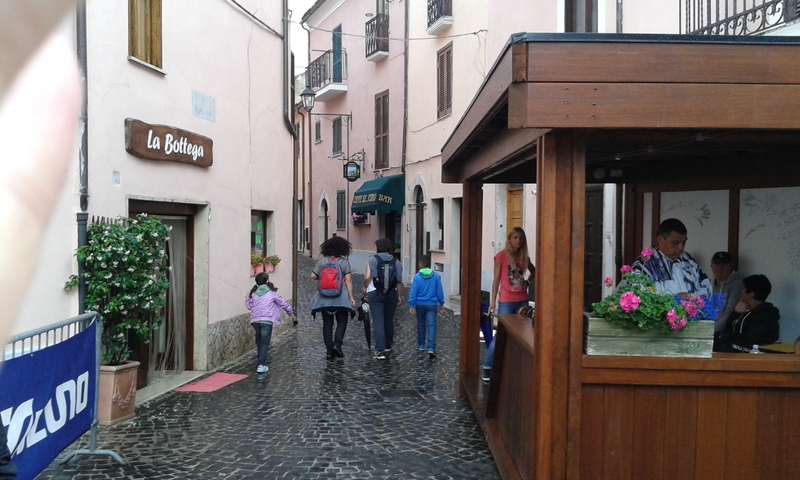 You can feel that atmosphere of the middle age, typical in central Italy, in the stony alleys, little colorful houses and churches. 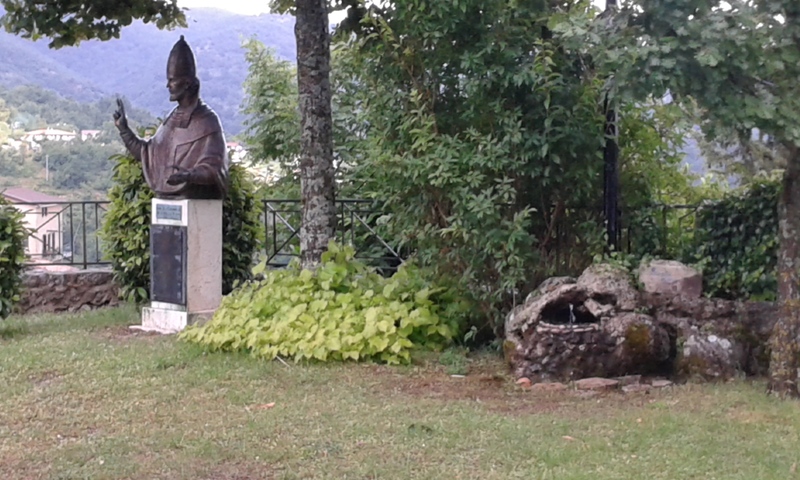 In the late 12th century, it was the birthplace of Pope Alexander IV. 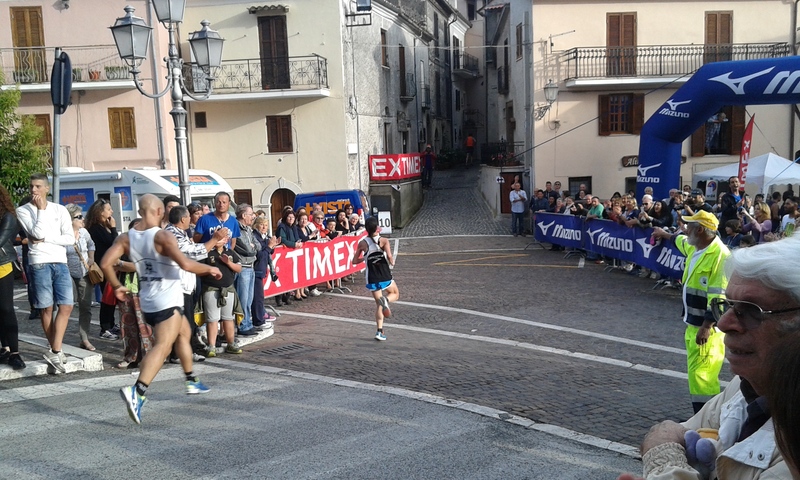 Running uphill is not exactly what Mr Run loves the most, in fact he confessed he had even pondered to leave the race at the third kilometer. But Mr Run is not a quitter, particularly in the land of “Ora et Labora” so after that short crisis, he rolled up his sleeves and managed to end the competition in 51 minutes. 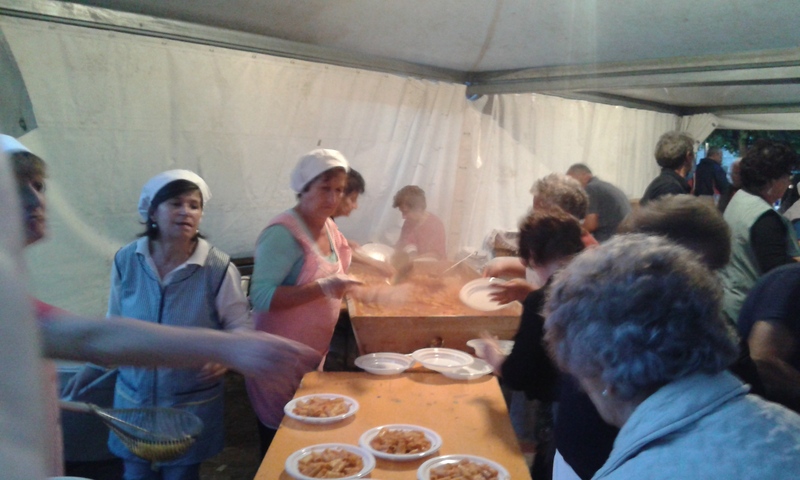 He was disappointed of course, but his discontent didn’t last long, as after the race, the inhabitants of the village had organized a feast for the runners and their families, based on the local culinary delights as pasta with mutton tomato sauce, roasted mutton etc. Let’s admit it, we are scared. Teaching has become such a risky occupation nowadays, that our most urgent concern, believe me, has nothing to with education at all, but rather with our professional and physical safeguard. Why? There are two main reasons : there has been a shift of responsibilities from family to school for what concerns the care of the child, but at the same time parents find harder and harder to accept teachers’ judgements. Cooperation has become critical, that’s why nowadays everything is focused on communication, which unfortunately has turned out to be a major weapon to be used against teachers. Families must be accurately informed about school performances, truancy, behaviour (please pay attention to the passive voice), therefore it is our duty to inform them and not THEIR duty to come to school and inquire after their child. Even if we have parents/teacher meetings one hour a week in the morning with every single teacher and twice a year in the afternoon with all, plus informal communication via email, two report cards, well, this never seems to be enough.That’s why towards the end of the school year every teacher leaves everything off to provide the families with the most recent updating in order to avoid the drama, which despite all the effort is always inevitable, but above all the risk that the school might be sued for not having informed in due time. The problem is that this tiring, bulky system does not work, because all these meetings are mostly attended by those families whose children have no real problems, while those who really have, rarely show up. They probably want to avoid the mortification of listening about their child’s (temporary) insuccess, which is felt either like their own or more often like the teachers’. It seems absurd, but it has happened that somebody deliberately left wrong telephone numbers in order not to be contacted. So when the end of the school year approaches, we start to feel that certain agitation that makes us worry more about form than contents. What really matters nowadays is whether we have diligently compiled, informed, signed , registered; everything but educating and forming the new generations. 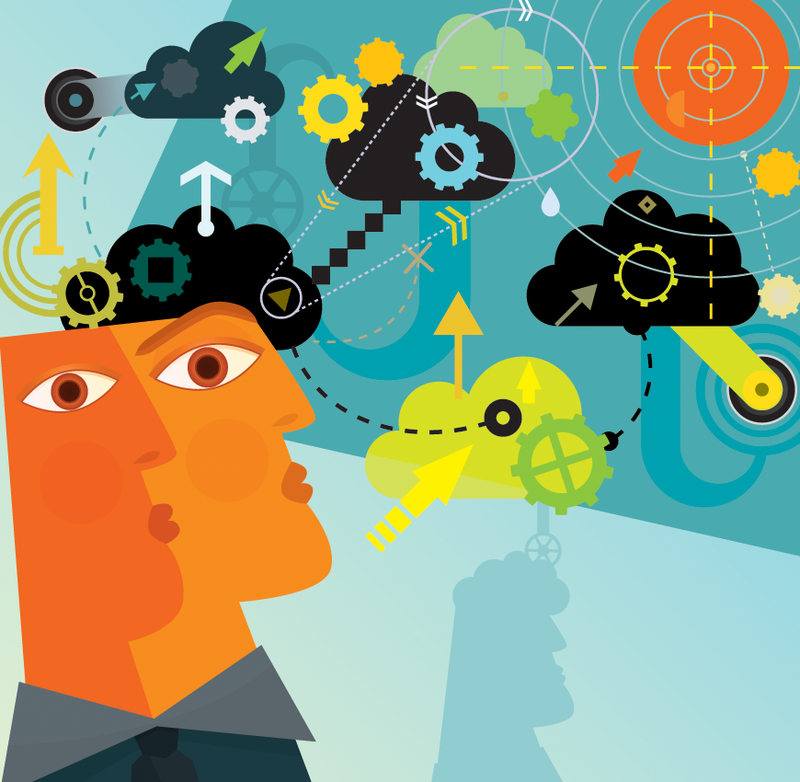 The truth is that we are missing the real object of our profession: the student. When school is about to end, drama is always behind the corner. Those families that you haven’t seen for a whole year, suddenly materialize when they read that their child has failed. What you meet, then, is anger, rancor, bitterness that can become violence sometimes as it happened in Cosenza (south of Italy) only few days ago. The parents of a sixteen year old girl are summoned by the deputy head-mistress of a high school to inform them of the reason of their girl’s failure and to discuss learning strategies for the future. A normal procedure, in fact. 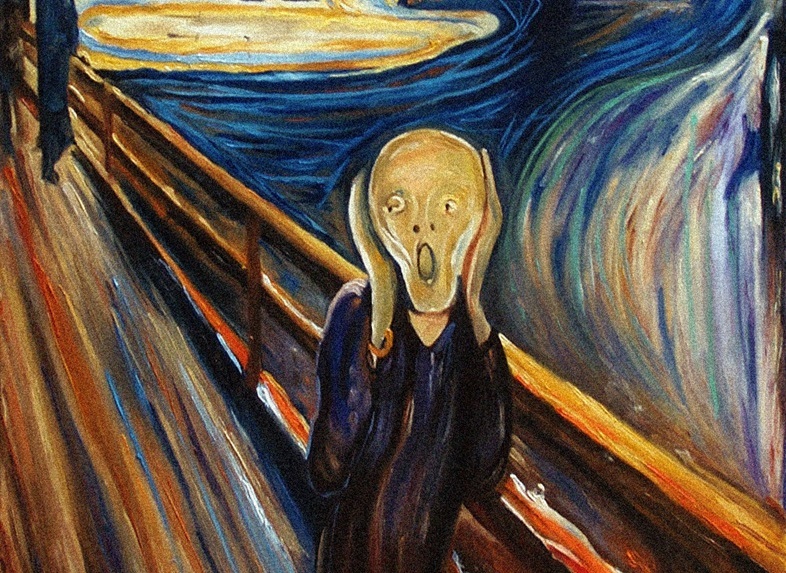 At first it seems an ordinary teacher/parents conference but all of a sudden something changes. The atmosphere becomes more agitated so that the deputy head-mistress grows alarmed and invites the two to leave the room. 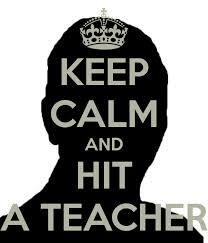 The father, then, rushes to the door to bar the entrance and while the teacher struggles to find a way out, the mother attacks her from behind, makes her fall and once on the floor, grabs her by her neck and twist it with the intent of breaking her neck bone, while her husband is on watch at the door.The teacher attempts a reaction, but the father starts to kick her in her breast and stomach repeatedly till she faints. Then they manage to slip outside the room and leave the school unseen from a secondary entrance. When the teacher awakes, she has to be carried to the hospital and afterwards she sues the two. The girl has declared to be very proud of her parents’ doing as justice has been done.